Homes that lack central air conditioning does not require an installation of expensive and unsightly window-mounted air conditioners or fans to keep cool. Central air conditioning, on the other hand, is an expensive investment. Fortunately, you have the convenience of incredibly convenient and affordable options available. A portable air conditioner is just that, movable and you can use it wherever you want. Use it in the lounge during the day and move it to your bedroom for a restful cool night. 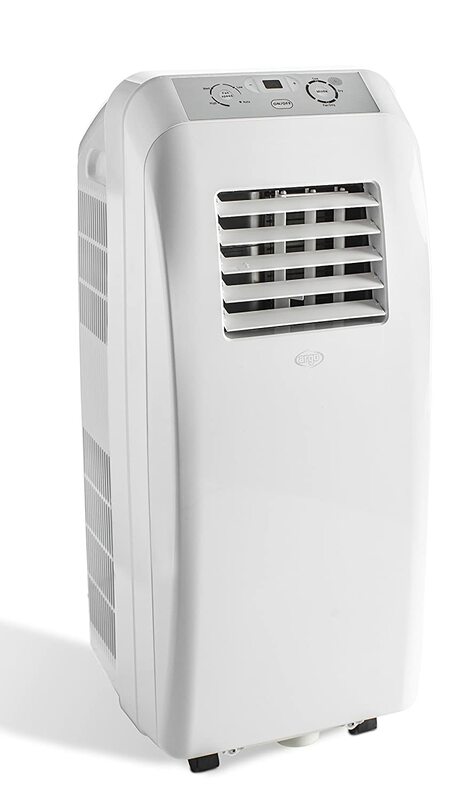 The typical portable air conditioner plugs into a wall outlet and removes moisture and warm air from the air. Designed to keep your room cool and comfortable, it uses an electric motor. The reasoning of an air conditioner is to remove hot air from a room while cooling it simultaneously. This requires taking the hot air somewhere and it is commonly done by a hose that vents through a window. All you need to do once you have connected the hose, which is simple, and your unit will come with an instruction manual on how to turn it on. They use standard 120 Volts power, therefore, you do not need particular wiring or a special outlet either. During the removal of the hot air, it also removes moisture from the air. You will notice on the air conditioner’s specification the amount of moisture it collects in a day. The average is 24 litres per day if you get a good unit. The question though, where does the moisture go? You get different types and an excellent model will be one that self-evaporates. This type of unit is advanced as they automatically evaporate moisture through the same hose at the same time as the hot air. You will never need to empty collected water for a self-evaporating air conditioning unit. Other models have a condensate pump with a gravity drain which will be a twin hose unit. You will have to connect the hose and drain the collected water into a bucket or lead it to a drain if possible. You also get air conditioners that require manual removal of water. Inside the unit is usually a bucket where the moisture is captured. Due to the size of the portable air conditioning unit you cannot expect to have 24-litre bucket concealed, therefore do you need to empty the bucket at regular intervals. Usually, they require emptying every 8 to 12 hours. The other downside of these models is that the unit needs to be turned off before emptying the bucket, which requires it to restart and cool the room again. When you are looking at the correct size capacity, you look at the air conditioner’s BTU rating. BTU is the acronym for British thermal unit and this measurement is used in gauging the cooling capacity of a particular air conditioner. When you know the area size of your room or office, you will know how much BTU’s you need. What you need to do is measure the width and the length of your room and multiply them, this is your room’s area. You do not need to feel intimidated by the technical aspects as it is quite straightforward. An air conditioner also has a given wattage. If an air conditioner has 3, 412 BTU, it means it will consume 1KW during an hour. Ovens and stove add to the heat inside your home and when you plan on using your portable air conditioner in your kitchen, you will need to add 4,000 BTU’s to your needs. If you use it in your lounge where more than one person is present, you need to add an additional 600 BTU’s when there are regularly four or more people in the room. Up to three people would be fine, but for every extra person add 600 extra per person. When you use the air conditioner in an exceptionally sunny room, increase its capacity by 10%. You need to consider that an air conditioner has some noise level which differs from one to the other. It depends where you intend to use it, and often could some brands be too noisy to sleep peacefully even though the room might be cool. The measurement of sound is the Db as you will see it on the unit you are looking at buying. To make it easier for you, when you are breathing normally, it will register around 10 decibels. A standard air conditioner has decibels that range between 50 and 75, which is quite low and low noise. This is an important aspect to look out for as it could make the world’s difference. The Argo Clima offers adjustable speed levels with three levels of speed with 2640 watts cooling effect. It also features a dehumidification capacity of 24 litres that will last you an entire day of continuous use. It has a noise level of 49.3 and features a timer and digital control panel with LED display. With its 10, 000 BTU rating you have a very powerful option with the Argo Clima with the lowest cooling setting available at 16 degrees Celsius. The Amcor SF8000E is ideal for homes and offices with a capacity to effectively cool up to 18 square metres. It offers excellent value and is compact, stylish and portable. Aside from powerful air conditioning it is a three-in-one unite with an A rated efficiency. 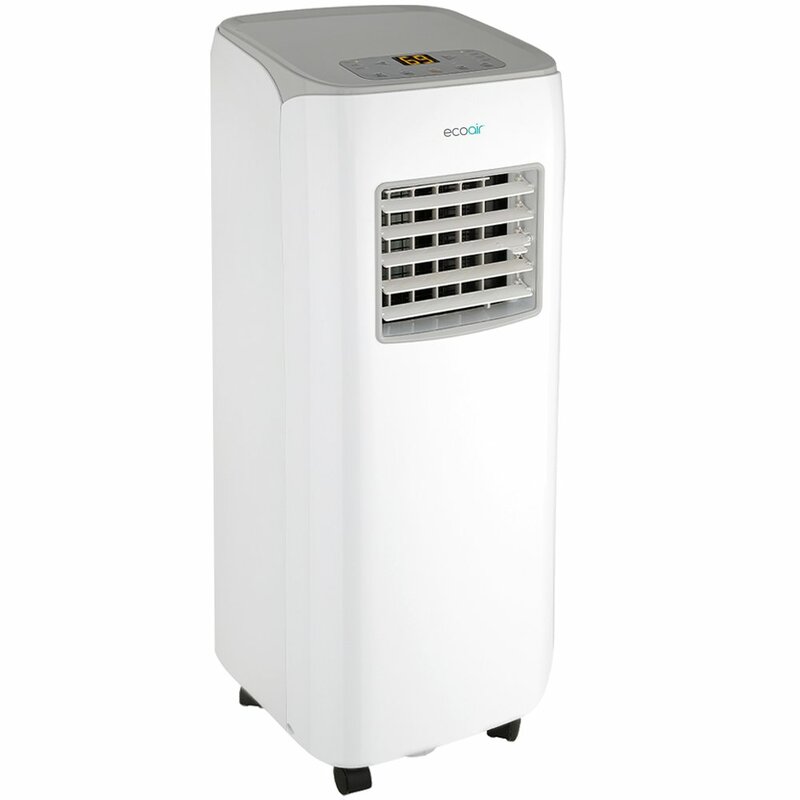 It is a slimline 3-in-1 air conditioner, fan and dehumidifier. Users have three mode settings ranging from fan, cool to auto options. It has a quiet 54 to 65-decibel noise level with a quiet twin-speed turbo fan. The 7, 000 BTU rating already tells you that you have a powerful air conditioner and as a three-in-one machine, it is capable of cooling a large space with a low noise factor. The EcoAir Crystal uses castor wheels and is extremely portable with easy mobility. 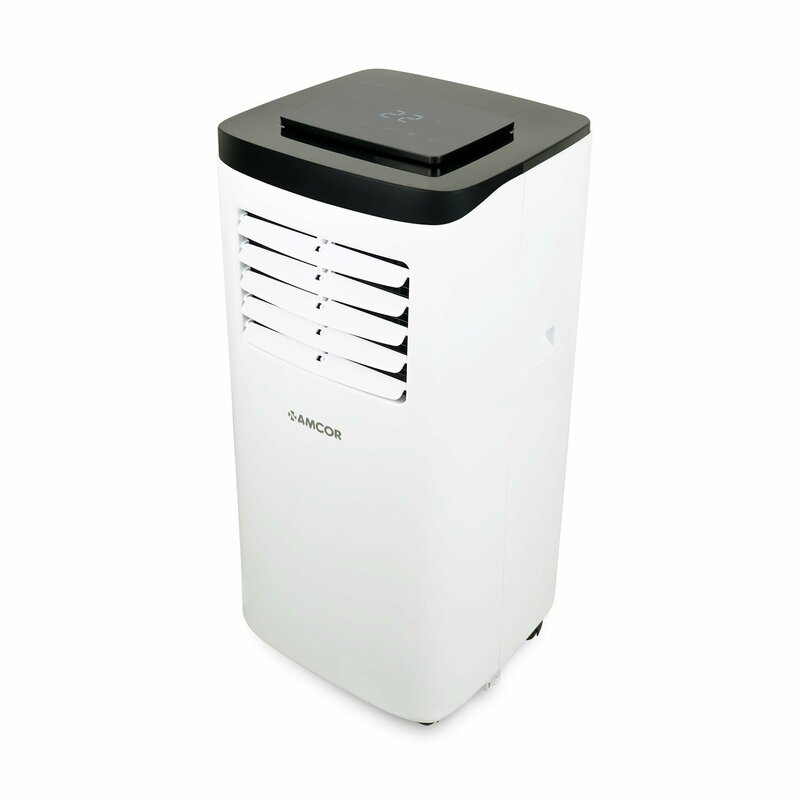 It is a two-in-one that dehumidifies during hot weather while cooling a room effectively. You will save on energy bills with the A grade energy rating during operation. In addition to using it as a mobile air conditioner can it be mounted too if you do not want to move it around. It is attractive, sleek and lightweight with a special anti-mildew fan that prevents any smells coming from it. It has one excellent other feature, which is its ability to self-evaporate. It is powerful with a 9, 000 BTU rating and 2.6 KW. The EcoAir Crystal is the best buy and ideal for homes and offices and quiet enough to use overnight in a bedroom. Its moisture removal level is 24 litre per day. You can set it to start cooling your home while at the office with a timer setting allowing 24 hours settings.